Home » events » ty-ku tasting. winchester wine and spirits.winchester ma. ty-ku tasting. winchester wine and spirits.winchester ma. 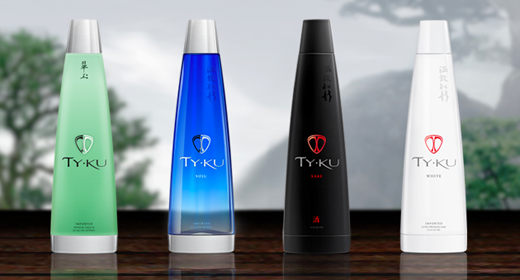 The current TY KU premium product line-up includes the highest quality Sake and Soju/Shochu in the World. TY KU Sake portfolio: TY KU Sake Silver (Premium Junmai), TY KU Sake Black (Super Premium Junmai Ginjo) and TY KU Sake White (Ultra Premium Junmai Daiginjo). TY KU Low Calorie Asian Spirits portfolio: TY KU Citrus Liqueur and TY KU Soju. TY KU has been honored with a multitude of prestigious awards & accolades including: the coveted 6 Star Diamond Award (AAHS), Double Gold Medal (San Francisco Int’l Wine Competition), Platinum Award (SIP), iF Design Award, Rising Star Award (Beverage Information Group), Breakout Brand (Beverage World) and the Hot, New, Now Award (WSWA). Even though there is no information on their website, I called Winchester Wine and Spirits and confirmed a tasting this evening from 6pm – 8pm. If you have never tried Sake before or are just curious about Sake and Shochu; this will be a great entry level tasting.